Cancer Research UK Cambridge Centre and Canary Center at Stanford collaborate to fund innovative research to help diagnose cancer earlier. Developing new approaches to finding and stopping cancer earlier is the goal of the Early Detection Programme at the Cancer Research UK Cambridge Centre. At the Programme’s 3rd annual meeting yesterday four exciting new research projects were announced, reinforcing Cambridge as one of the world’s leading Centres for research into the early detection of cancer. The Early Detection Programme has recently joined forces with another world-leader in early cancer detection – the Canary Center at Stanford in California. This an ideal opportunity to combine outstanding academic and clinical researchers from the UK and US to tackle some of the most challenging questions in detecting cancer sooner: how to identify those at the highest risk of cancer, finding new ways to spot and cure the very first signs of cancer, and how to develop cost effective, non-invasive and reliable methods for early cancer detection. To establish the transatlantic collaboration, the Early Detection Programme at the Cancer Research UK Cambridge Centre and the Canary Center at Stanford are jointly funding four research projects exploring innovative ways to detect prostate, lung, oesophageal and renal cancers at an early stage. Vincent Gnanapragasam, a consultant urologist at Cambridge University Hospitals, is leading an initiative to stratify men diagnosed with prostate cancer according to how aggressive their tumour is. Working with Tanya Stoyanova, a radiology professor at the Canary Center and Charlie Massie, a prostate biology expert and Group Leader in the Early Detection Programme, the project will use data from a number of sources – including tumour DNA found circulating in the blood, protein molecules found in cancer cells and MRI imaging of the tumour – to identify patients with the most aggressive tumours so that they can be treated immediately. Men with slow-growing tumours will also be identified as these patients may not need treatment immediately, but need to be monitored closely so that any changes in their tumour can be picked up and acted upon. Robert Rintoul, a thoracic consultant based at the Royal Papworth Hospital, is exploring new ways to detect lung cancer at an early stage by studying the immune cells in blood samples of lung cancer patients. They will look for any evidence that the immune cells have recognised and responded to the cancer cells. He is collaborating with H. Tom Soh a professor of radiology at the Canary Center. Rebecca Fitzgerald, who co-leads the Early Detection Programme, is collaborating with Utkan Demirci at the Canary Center who has developed a new nano-technology using a magnetic field to separate different cell types. They will investigate whether the technology can be used to separate the mixture of cell types collected from the gullet when patients are given the Cytosponge test that Professor Fitzgerald has developed. The Cytosponge TFF3 is a cost effective, minimally invasive method for diagnosing Barrett’s Oesophagus – a common condition that can, in some cases, develop into cancer of the oesophagus. Charlie Massie, who is a group leader in the Early Detection Programme, is going to be researching whether it is possible to detect the early stages of a type of kidney cancer (Renal Cell Carcinoma) using biomarkers found in urine. He is working in collaboration with Olivier Gevaert at the Canary Center to look at specific signals in the DNA of cells called methylation. Discussing the project, Charlie said: 'Only 1-in-10 patients diagnosed with late-stage kidney cancer survive for 5 years. However, when kidney cancer is picked up at an early stage more than 8-in-10 patients survive for 5 years. If we can shift detection to an earlier stage we should be able to improve patient survival by facilitating early and effective treatment. The audience of nearly 200 cancer scientists and patients gathered yesterday at the CRUK Cambridge Institute for the annual meeting also heard about ground-breaking research already taking place in the Early Detection Programme. 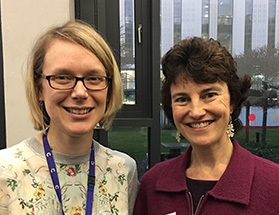 “The full auditorium with attendees from a range of disciplines attending including social and STEM sciences, clinicians, policy makers, funders and patients highlights the importance of research and debate into the Early Detection of Cancer”, commented Rebecca Fitzgerald, who hosted the meeting with Sarah Bohndiek, co-lead of the Early Detection Programme. and pinpointing which lung cancer patients are most at risk of developing another primary cancer after surviving initial treatment. The event concluded with a lively panel discussion between scientists, clinicians and cancer survivors about the benefits and potential pitfalls of detecting cancer at an early stage, in response to the question 'Is it possible for cancer to be detected too early? '.